3 bedroom, 2 bath in Rancho Las Palmas Country Club. Lovely 30 plan decorated with contemporary furnishings throughout. There is a king size bed in the master bedroom, a queen size bed in the 2nd bedroom and two twin beds the 3rd bedroom. This condominium provides enough space to easily sleep six. There are cable TV’s in the living room, master bedroom and a small TV in the bedroom with twins. The dinning room provides seating for four but chairs can be added for six and there is a breakfast table in the kitchen that seats four. This vacation home exceptionally well equipped throughout with an eye towards comfort and style. The extended back patio is the perfect spot for a sunset bar-b-que with plenty of seating and expansive views of the West 3rd and West 4th fairways and breathtaking Western mountains. The pool and spa are one building away. 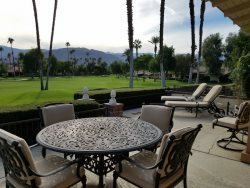 This location is close to The River at Rancho Mirage, the Rancho Las Palmas Resort and Spa and the tennis courts and clubhouse. An easy walk to everything! Wireless Internet connection is available as well as free local and long distance U.S. and Canada calling. Just a short walk to The Tennis Courts and the Clubhouse.